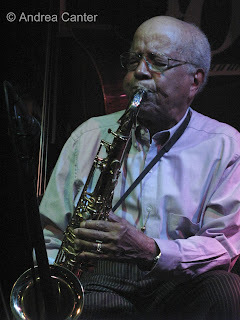 I’m not sure how many times I have attended a birthday gig for intrepid saxophonist Irv Williams, but I’ve witnessed a fireball of birthday candles since at least number 84. That was five years ago. Over the past decade, Irv has battled cancer, maintained a weekly Happy Hour gig at the Dakota, led nearly every countdown on New Year’s Eve at the Artist Quarter, and released four recordings over a mere four-year period (from age 85). He’s been a frequent headliner at the Twin Cities Jazz Festival, received a Legend of Jazz tribute at the 2006 KBEM Winter Jazz Festival, and this past spring was inducted into the Minnesota Music Hall of Fame. If there is but one living icon of jazz in Minnesota, it is Irv Williams, aka Mr. Smooth. This past weekend, we helped Irv celebrate #89. He needed no help blowing out the candles. He certainly needed no help blowing his tenor sax over three consecutive nights, Friday and Saturday at the Artists Quarter and an encore on Sunday at the Dakota. 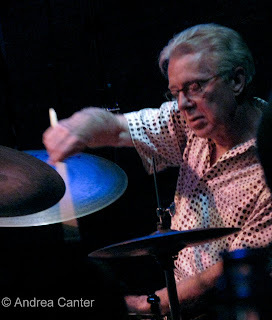 If you question the loyalty of his quartet cohorts, note that Sunday night was the very first time that AQ owner Kenny Horst has played drums on the Dakota stage. Kenny was not about to miss a gig with Irv. It’s not that Irv is immune to the infirmities of aging. His gait is a bit slower these days. He might even be a bit shorter, but then he has always been small in stature, fat and mighty in tone. His stamina has waned a bit over the past decade, meaning that his gig at the Dakota Sunday night was limited to two robust sets. (“I’m glad we’re only doing two sets,” said Kenny Horst. “I’m tired—we played two late nights in a row.”) If Irv was tired, he didn’t let on. Between sets he shook hands, signed autographed, and cracked jokes with the Dakota patrons. And admitted he was working on a recording of holiday tunes. Irv is known widely for his vast knowledge of the jazz canon, his ability to play any song in any key. This weekend he treated us to recent favorites leaning more toward balladry and elegance than hard bop angles and fleet phrases—his own “Debra’s Dream,” his emblematic “Old Folks,” the always sweet and lovely “In the Wee Small Hours,” a Shirley Horn favorite and increasingly meaningful “Here’s to Life.” Smiles crossed the stage frequently between his long-time pianist Peter Schimke, bassist Jay Young, and drummer Kenny Horst. This multi-night weekend was not the norm. Now Irv will return to his more staid schedule, every Friday night Happy Hour at the Dakota, every Thursday with Peter at Il Vesco Vino, an occasional quartet gig. And doing that research. As long as he can blow, let him eat cake! Photos: Top, Irv Williams at the AQ, Birthday Party August 15th. Bottom: Kenny Horst in historic appearance at the Dakota, Birthday Party August 17th. Photos by Andrea Canter.